Last week I was blessed to receive this bundle of organic, delicious and healthy products from Healthy Gourmet Singapore! 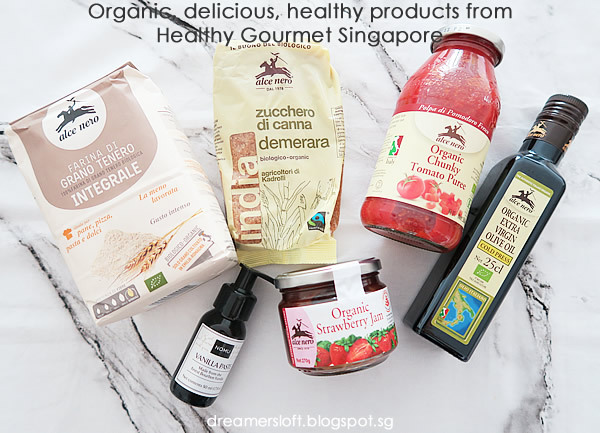 Healthy Gourmet Singapore is an online grocery store committed to bring in all-natural and contaminant-free products with no harmful chemicals and additives, to consumers who share the same belief about sustainable farming practices and respecting the environment and our body through the right food choices. 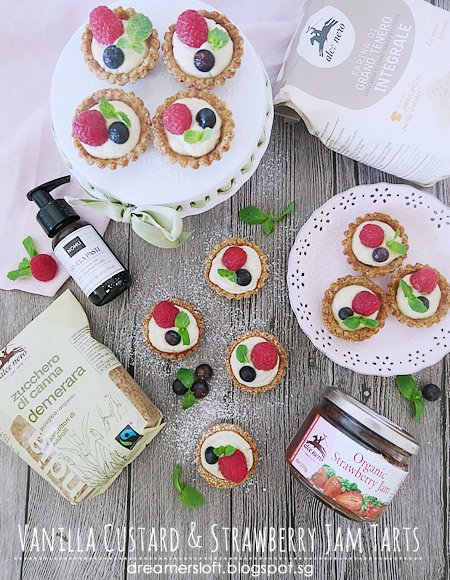 Brands that the webstore carry include Alce Nero, Belvoir Fruit Farms, NOMU and Ortalli, and range from cooking ingredients such as condiments, pasta, sauces, spices, to baking needs such as vanilla paste, chocolate and jams. I had the privilege of selecting any items from the store to create dishes with them; was literally spoilt for choice as there were so many items that I wish to have! Since Christmas is a month away, I decided to create a simple dessert and another one-pot dish which could be put together easily and yet visually appealing for the upcoming festive celebrations. 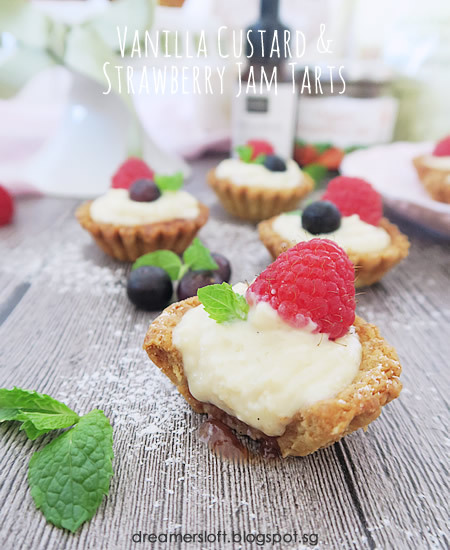 Presenting my first dish, Vanilla Custard & Strawberry Jam Tart, created using Alce Nero Organic Soft Whole Wheat Flour, Alce Nero Organic Demerara Crystalised Brown Sugar, Alce Nero Organic Strawberry Jam and NOMU Vanilla Paste. Personally I don't have a sweet tooth and I also try to cut down on sugar intake and use more healthy ingredients for my bakes. This is the first time I introduce whole wheat flour and demerara brown sugar in my bakes and the result turned out great! The whole wheat flour, brown sugar and vanilla paste were used in the tart pastry, and the vanilla paste and brown sugar were also added in the custard. To create more depth and layering in the tart, I filled the tart shells with strawberry jam before topping with vanilla custard. I must rave about the NOMU Vanilla Paste as well! I'm very particular about vanilla paste and extract and use only the best quality ones (certainly no essence which is basically chemically-derived). NOMU Vanilla Paste contains pure vanilla seeds combined with cold pressed Vanilla Extract, and it's bottled in a dispenser pump which is such a brilliant idea! Mess-free and so easy to use; I'm totally in love with the product. 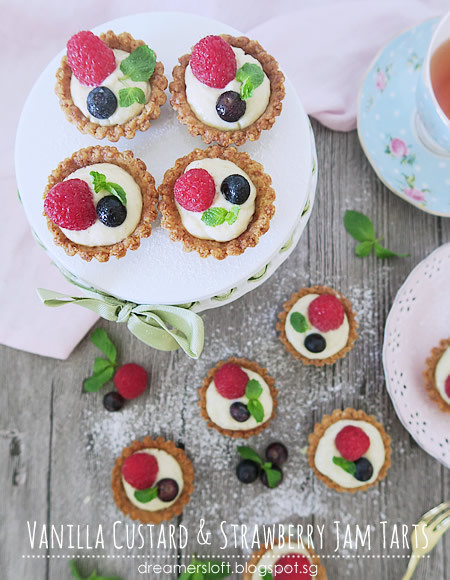 Love the different textures created in this tart. 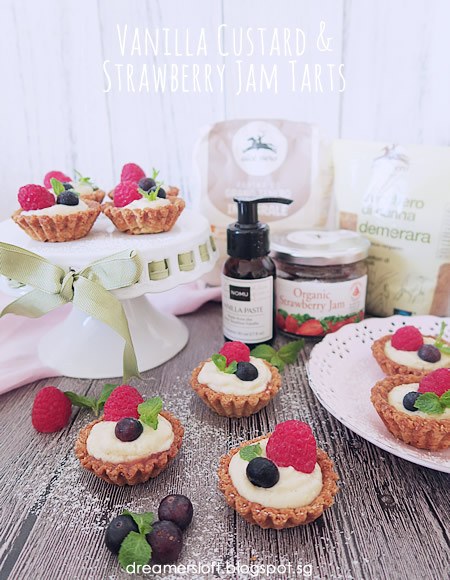 Rustic crunch from the tart shell, natural fruity sweetness from the strawberry jam, creamy and lovely scent from the vanilla custard, fruity tang from the fruits and finally mint leaf to refresh the palate. I used strawberry jam for the layering this time, in fact any other jam flavours are fine. As for the toppings, any fruits would do, I selected raspberry and blueberry as they look so christmasy together. The mint leaf created a stunning colour contrast to the tart and I always like to add it to bakes as they are so refreshing. 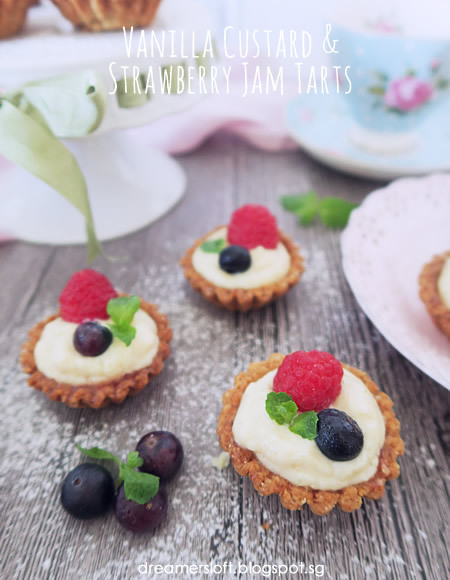 The tart shell and vanilla custard can be made a day in advance. After baking the tart shells, just store them in an airtight container. For the vanilla custard, I filled it to a piping bag and store in the the fridge. The next day, simply assemble, decorate and ready to serve. Sift flour into a large bowl, add sugar and mix well. Add cold unsalted butter cubes. Using finger tips, break the butter and rub the butter into the flour mixture, until it resembles bread crumbs. Add egg yolk, vanilla paste and fresh milk to the mixture, use a scrapper to help with the mixing. Knead the dough gently into a ball. Place the dough between 2 pieces of plastic sheet. Roll the dough to about 4-5mm thickness and place in fridge to rest for about 1 hour. Remove the dough from fridge. Dust a baking mat (and rolling pin) with flour, use a fluted cutter to stamp the dough. Place the cut dough over the tart case and gently press it downwards. Using finger tips, gently press and mold the dough into the tart case. Use a fork to poke holes at the base of the tart pastry. 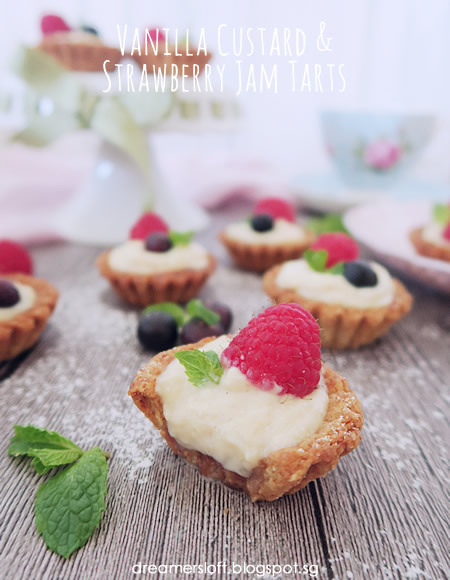 Bake the tarts at 180C, fan mode for 15mins. Remove from oven and place on wire rack to cool. After the tart shells are cooled slightly, remove them from the tins and let cool completely before assembly. 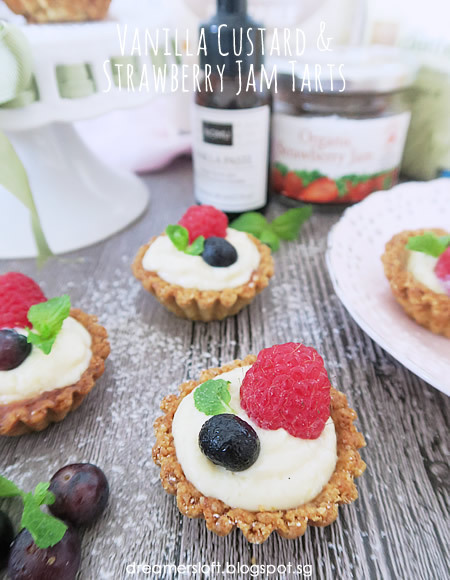 *if assembling tart next day, store the tart shells in an airtight container. Add fresh milk and sugar into a small pot. Place the pot into a large, shallow pan/pot with barely simmering water. This is the bain marie method, to create a gentle and uniform heat for cooking custard. Keep stirring the mixture till everything is melted and well-mixed. Add sifted corn starch. Mix till well-blended, the mixture will thicken slowly. Add the egg yolk and keep stirring till well-blended, the mixture will further thicken into custard. Add 1 tsp vanilla paste and mix well. Sift the custard for a smoother texture (as they may be some fine lumps and grainy bits in the custard). Cover the surface of the custard with a clingwrap and let the custard cool down completely. Fill the custard into a piping bag. Set aside. *if assembling the tart next day, store the bag of custard in the chiller. 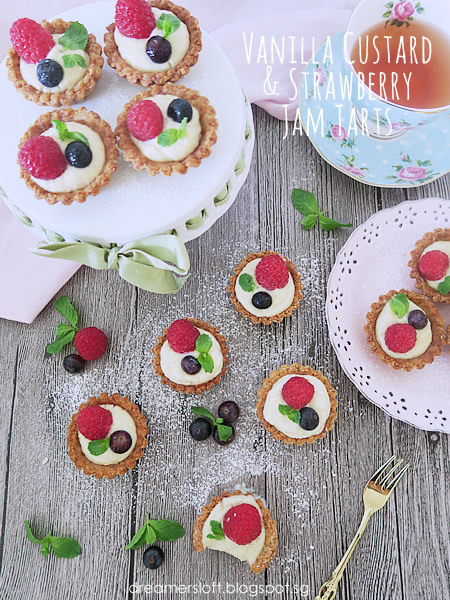 Fill each tart shell with 1 tsp of jam. Pipe the vanilla custard to fill the tart shell. Top with raspberry, blueberry and mint leaves. 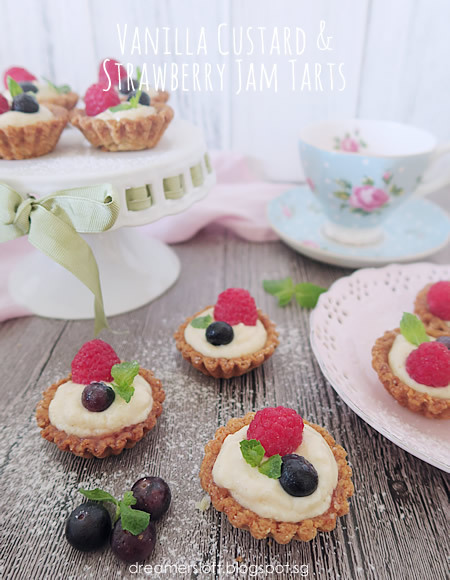 Don't these tarts look lovely? They are great for Christmas parties, or in fact any tea parties. I'm already thinking of making them again for an upcoming gathering. Stay tuned as I used the remaining ingredients from Healthy Gourmet to create another simple one-pot dish!